Recognized for promoting quality in endoscopy, Westside GI Center has been acknowledged by The American Society of Gastroenterology that our endoscopy unit is dedicated to delivering high-quality endoscopic care and has received specialized training around these principles. 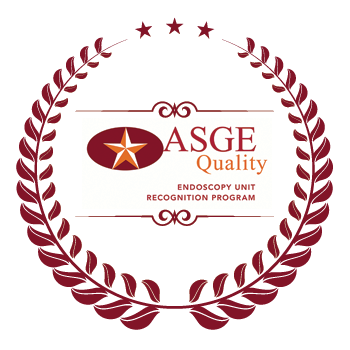 ASGE is known as the profession’s leader in setting standards for excellence in endoscopy. The ASGE Endoscopy Unit Recognition Program promotes quality in endoscopy by encouraging endoscopy offices, centers and units to adhere to ASGE guidelines on privileging, quality assurance, endoscopy reprocessing, and CDC infection control guidelines. An important requirement of the program is attendance by a representative of the unit applying for recognition at an educational course entitled “Improving Quality and Safety in Your Endoscopy Unit,” at which the related guidelines are thoroughly reviewed. Upon completion of the program and confirmation that the guidelines have been adopted, units receive an ASGE “Certificate of Recognition” for promoting quality in endoscopy. Since 2008, ASGE has recognized units in all settings where endoscopy is practiced in the United States, as part of its programs dedicated to promoting quality in endoscopy. The Certificate of Recognition award is granted for a three-year renewable period.